If you start commuting to work by bike, it will not be long before it seems as natural as going by car. It’s that simple. This assumes that you are reasonably fit and live within a manageable distance from work, two conditions which cover a large number of commuters residing in the Ottawa-Gatineau area. Although it is surprisingly easy to make the transition from commuting by car to bicycle, anyone planning to do so for the first time will probably have a few questions. This article attempts to provide some answers about commuting to work on a bicycle. It is written from the perspective of someone who might be commuting 8 to 15 kilometres to an office job in downtown Ottawa. With a little improvisation, most of this information should be relevant to people working in different job settings, or commuting to other parts of town. Bicycle commuters heading towards downtown Ottawa. If you live under 10 kilometres from your place of work, you are in an ideal distance for bicycle commuting. Most people who reside 10 to 20 kilometres away will also find it quite easy to cycle to work, although the distance in the high end of this range will become a little more demanding. Although a good number of individuals ride over 20 kilometres to get to work, commuting such distances does require more of a commitment. In Ottawa, this means that people who live within the greenbelt and work downtown should consider themselves prime candidates for becoming successful bicycle commuters. It is also worth noting that many people will be comfortable riding longer distances they have an interesting and relaxing route to get to work. This would likely be the case for people who have the option of cycling to work on one of the pathways which runs along the Ottawa River. Battling heavy traffic through a series of busy roads is a sure fire recipe to turn you off bicycle commuting. It is therefore important to map out a good route to work that will make maximum use of paths, bicycle lanes, or quiet side streets. You may want to do a little exploratory riding in the evening or on weekends to figure out your best options. When doing so, remember that the shortest route to get downtown is rarely the best one for cycling to work. It will be well worth your while to add a kilometre or two to your route if it minimizes your exposure to heavy traffic, and increases the amount of time you’ll spend on paths, bicycle lanes, and quiet streets. Don’t give up hope if you live in a part of town where it may first appear that you have few choices except to ride significant distances on busy streets. With a little research, it is often possible to find alternatives that are suitable for a bicycle, but otherwise impossible or impractical for cars. For example, you can sometimes identify useful routes that cut through parking lots or that make use of bits and pieces of pathways that are scattered throughout the city. You’ll probably want to study the official Ottawa-Gatineau cycling map to see what is possible in your neighbourhood. This paper map is free and widely available from the NCC, the cities of Ottawa and Gatineau, and tourist information centres. You can even pick one up at various points along the pathways (in the pockets under the large display maps). An online version of this map is also available. Don’t forget that Google maps also displays bike paths (in dark green) and bike lanes (in light green). To see them, go Google maps, click on the menu icon (3 horizontal bars) link in the upper left corner, and then click on the bicycle icon. Also, there is a Strava map that shows some of the more popular routes with cyclists. The brighter the line, the more popular the route. The “street view” feature on Goggle Maps is another handy tool for mapping out a route. Click and drag the little human symbol in the bottom right corner onto a street or road on the map, and you’ll instantly get a view of what things look like at that spot. You will be able to scroll around the image to change your perspective, and this makes it easy to see if the road has a paved shoulder or is otherwise suitable for bicycle commuting. If you are unsure about a route, give it a test ride on a weekend. Also, it never hurts to ask for route recommendations from cyclists you see commuting to work. Since bicycle commuting only involves riding 10 to 15 kilometres in one shot, you don’t have to be in top physical condition. Recreational cyclists who do some riding on weekends should be able to handle this without too much trouble. Depending on your level of fitness, you may start off by cycling a little more slowly and maybe only riding to work every second day. Whatever the case, bicycle commuting is an extremely effective way of getting into shape, so it will not be long before you’re biking to work five days a week without giving it a second thought. As an added bonus, bicycle commuting will dramatically improve your capacity for riding longer distances on weekends or when bicycle touring. Although bicycle commuting doesn’t usually involve very long distances, it may still be beyond your capacity if you have led a fairly sedentary lifestyle or haven’t been on a bike for while. However, this doesn’t let you off the hook for being a potential bicycle commuter. It simply means you’ll first have to take a little time to gradually build up your capacity for cycling. You’ll probably have to do this incrementally with a series of short rides during the evening and on weekends. Within a few weeks you should be ready to bike to work. For more details, see “Getting Started – a Primer for Born-Again Cyclists“. While not absolutely necessary, you may want to look for commuting bikes that have certain features. For example, braze-ons (eyelets or mounting points) for mounting a rack or fenders to a bicycle can be very handy. If you are considering using a mountain bike, you’ll ride more efficiently with a model that does not have full suspension. 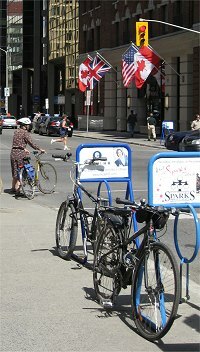 Bicycle parking next to the Place Bell Building on Elgin. 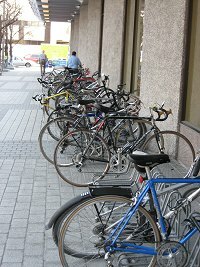 Where you plan to park your bike in town can also influence what you will to use for commuting. If you will be locking it outside on the street, you’ll want to ensure that it doesn’t become a target for bicycle thieves. In this case, you may be better off with a run-of-the-mill hybrid or mountain bike that doesn’t stand out from the crowd (i.e. one that’s not too expensive). Likewise, you could use an older bike that has lost some of its gloss. Old 10 and 12 speed bikes with the shift levers on the downtubes are popular for this reason. If you do use an older bike, remember that you’ll still have to keep it in top mechanical condition. If you’re lucky, you may work for a company or government department that provides a “bike cage” or “bicycle room” where employees can securely store their bikes. If so, you could even commute with an expensive top-of the-line carbon-frame model, something that is not recommended for people who have to lock their bikes on the street. The existence of “bicycle rooms” may not be obvious at your place of work, so it’s worth asking around. Moreover, there may insufficient space to meet the demand for such facilities, so you may have to put your name on a waiting list to get a spot in such a room. People who don’t have access to a bicycle room or cage may have another option if they work in a large high rise office building. Check the building’s underground parking lot to see if it has any bicycle storage racks. In many cases, there is no charge for using these racks. 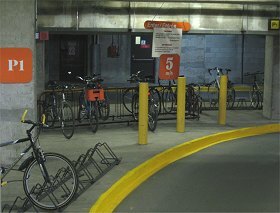 Bike racks in an underground parking garage. Remember that one of the best sources of information for options about parking and locking a bike in town will be other people who cycle to work in your area. Don’t be shy about asking for some advice. Getting your bike stolen becomes a real concern when you park it in a public place for eight hours a day, five days a week, month after month. Although there are no guarantees, there are basically two precautions to help keep your bike from being stolen. First, as mentioned earlier, is use a bike that blends into the background – i. e. nothing too new, too shinny, or too expensive. Second, adopt a good protocol for locking your bicycle. 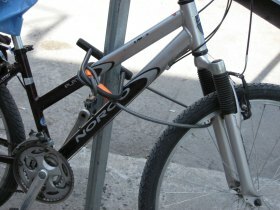 Generally, you should make it a practice to lock your bike’s frame and rear wheel to a solid metal bar or post with a good quality U-lock (preferably one where the key is inserted perpendicular to the locking cylinder as opposed to the less robust models where the key is inserted at the end of the cylinder). You may also want run a cable from the U-lock, or devise some other method, to secure your front wheel and seat, especially if these are equipped with quick release mechanisms. 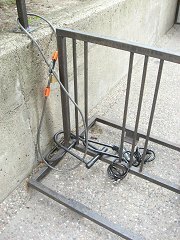 If carrying around a super heavy U-lock and assorted cables seems a bit much every time you commute to work, consider leaving these items locked to the rack where you’ll normally be parking your bike. You’ll be able to ride without the extra weight, and the lock and cables will be there waiting every time you get to work. The only problem with this strategy is that you’ll have no way to lock your bike if, when heading home, you decide to stop to do some shopping or to socialize with friends after work. Some people carry a lightweight lock for this purpose. You can generate a good amount of sweat by pedaling hard for 10 to 15 kilometres on a hot day. This will not be a problem for the minority bicycle commuters who happen to work for a company or government department which provide employees with shower facilities and locker rooms. Those of us who are not so fortunate may simply assume that a lack of shower facilities means that bicycle commuting is not a viable means of getting to work. Wrong. We live in Canada, where it is often cool, cold, or freezing. When commuting in early spring or late fall, you’ll want to pedal hard to stay warm. Nevertheless, there is still that eight week period in summer when we are likely to encounter some exceptionally hot days. But even this isn’t such a big problem. Temperatures are typically much cooler early in the morning, even when the forecast calls for scorchingly hot weather later in the day. Moreover, many of us take a good part of our vacations during this period, which further reduces the number of days when we have to worry about sweating when cycling to work. If you do find yourself cycling to work on a particularly warm morning, take a little extra time, go a little slower, and pedal at a speed just below your “sweat threshold” (you’ll get a knack for gauging how hard you can go before breaking into a major sweat). This means those cyclists lucky enough to have access to a shower at their workplace will zip by you, but you’ll have the satisfaction of knowing that you are taking the time to truly appreciate the glorious summer day. If you really want to go fast, save it for the ride home when you’ll be able to jump into a shower when you get off your bike. There other mitigating measures to keep you from becoming offensive to your co-workers. Changing from cycling clothes into regular street clothes once you get to the office will do a lot to keep you fresh. Although it may sound counter intuitive, shower before riding to work. Sweat by itself doesn’t smell very much – odour only starts to become a problem once it mixes with the bacteria on your skin. The cleaner your skin, the less chance of odour problems. And finally, it never hurts to keep a box of baby wipes and a bar of underarm deodorant at the office for those days when you may have lacked the self-discipline necessary to stay under your “sweat threshold” (i.e. you forgot to slow down to appreciate the glorious summer day). If you’re riding less than 5 kilometres when the weather isn’t too hot, cycling to work in your regular everyday clothes is definitely an option. This is what they do in Amsterdam, where many people rely their bikes like North Americans use their cars. In fact, the Dutch would probably scoff at the idea that you have to dress up in special clothes to ride your bike somewhere. However, our cities are less compact, meaning that we tend to ride longer distances, and our summers are hotter. In July, the average high in Ottawa is over 6°C warmer than it is in Amsterdam. In other words, you’ll probably want to have one set of clothes for cycling, and another for work. For cycling, you could always splurge on expensive bike clothes, but you’ll also do fine with garden-variety sportswear that is made of synthetic material. Such material is very breathable and good at wicking moisture away from your body. In terms of office clothes, you’ll have to devise some sort of system for bringing them home to wash. Many people simply bring everything back and forth everyday, while others will adopt a routine of rotating different pieces of clothing between their workplace and home over a period of several days. Some people who dress in full business attire will use a downtown dry cleaning service, thereby eliminating the need to transport their work clothes back home for washing. With a little experimenting, you’ll come up with a system that works for you. Although cycling to work doesn’t require much in the way of special equipment, you may want to give some thought as to how you plan to carry a change of clothing and other items back and forth. Since you will only be riding short distances, and if you are not transporting anything very heavy, you’ll be able to get by with a small backpack. These can make your back sweaty, but you can help alleviate this problem with mesh frame models that keep the pack suspended a few centimetres off your back. with a cable to secure the front wheel. If you have to cycle longer distances, or transport heavier items (e.g. lots of documents), the general rule is that the bike should carry the load, and not the rider. This means installing a rear rack on which you will be able to attach various types of bags. Pannier-type bags are a good option for moving stuff between your home and workplace. They are sold as a pair and the bags clip on both sides of the rear rack. They will also come in handy is you decide to do some bicycle touring. You can even buy briefcases for cycling which are designed to clip on the side of a rear rack like panniers (these are sold individually, not as sets). Before getting one of these, make sure there is enough clearance so that the heel of your foot (during the back stroke) will not catch the briefcase when it’s clipped on the rear rack. Although not everyone uses them, at some point you may find that it’s worth equipping your bike with inexpensive lightweight plastic fenders (a godsend when the roads are wet). In case you end up working late, it’s always a good idea to carry a set of front and rear LED lights. Many experienced commuters who cycle in the dark when the days get shorter often use two rear lights for increased visibility. In addition to the rear light that mounts on the bike, you may want to get a second light which velcros onto your helmet. Many articles about bicycle commuting often start off by thumping all the advantages of cycling to work. Although most are self-evident, they are worth reviewing them if only to provide a handy motivational tool. Get healthy, be fit. Think about it. Riding 10 to 15 kilometres twice a day means you’re going to get seriously healthy fast. This will probably put you at the top of your age group for being fit and healthy, and this means you’ll have the capacity to pursue an active lifestyle without fear or trepidation. Moreover, in combination with recreational rides on weekends, cycling to work should allow many people to start losing weight without any great effort. Save your hard earned money. If you currently drive a car to get to work – good news – you’re eligible to save a pile of money. Savings in gas money alone could be as much as $50 a week. Add to this parking fees and a percentage of the expenses associated with wear and tear on your car’s mechanical systems, brakes, tires, and so on. Ownership cost will also go down because your vehicle will last longer, and people who don’t use their car to commute to work everyday can sometimes get lower insurance rates. When you add it all up, this starts to represent a tidy sum. Make better use of your time. All things being equal, it is obvious that you can cover 10 kilometres by car faster than by bike. However, this difference decreases when traffic slows down during rush hour, and it can completely disappear when a car is stuck in a stop-and-go traffic jams. However, the main reason cycling is a time saver is because it allows you to do two things at once – (1) move yourself back and forth from work, and (2) get some health sustaining exercise. This is far more efficient that commuting to work by car, and then driving to the gym for a workout. Be environmental conscious. Motorized vehicles consume vast amounts of our energy resources, and are a major source of pollution and green house gas emissions. For all practical purposes, it’s the exact opposite with bicycles. Maybe you’re one of those people who, while concerned about the environment, are just a tad skeptical about all those doomsday scenarios. Okay, but next time someone is haranguing you about all that has to be done to save the environment, just tell them that you commute to work by cycling 25 kilometers everyday. That should buy you some peace and quiet. You are going to discover that a commuter bike requires much more maintenance than one that is only being used for the occasional ride around the neighbourhood. Your bike will have to be pampered from time to time if it is to faithfully transport you where you earn your pay. Failure to do could result in a mechanical breakdown on the very morning you were planning to dazzle your colleagues with a mind blowing power point presentation. The level and frequency of the maintenance required will depend on how far you’re commuting, how often, and whether you are using the bike for weekend rides or other activities. At the very least, expect to change the chain and rear tire once a year. This will probably be followed a short time later by a need to replace the brake pads, cables, and front tire. The bike will also require a major overall every 2 to 3 years which will involve such things as repacking the front and rear wheel bearings. This may be beyond the capabilities of average do-it-yourselfer, so the bike may go into the shop for a while. Try to schedule such work in late fall or during the winter when bicycle shops aren’t so busy. The most important thing you can do to maintain a bike and lengthen the life of its components is to keep everything clean. A lot of this will involve cleaning the chain and gears on regular basis. This job will be made easier with an inexpensive chain scrubbing device and a biodegradable degreaser (available at Mountain Equipment Coop at reasonable prices). When it comes to lubricating your chain, work the oil into the bushings and pins by turning the pedals with the wheel off the ground , and then wipe off any excess oil from the outside surfaces of the chain. Oil left on these surfaces simply collects dust and dirt. Avoiding rainy days by taking the bus or using your car may be the best option when you first start commuting by bike. However, you can keep this to a minimum by looking at the weather radar display for the Ottawa area on the Environment Canada web site. Click the animation bottom to see what’s happening. As you watch the clusters of rain clouds as they move through the region, you should be able to figure out if there’s going to be a window of opportunity to cycle to work between periods of precipitation. After a while you can get quite good at this, and you’ll be amazed at how often you’ll be able to cycle to work on rainy days without getting wet. You can also use the hourly forecasts on the Weather Network or Accuweather web sites to make a judgment call on what conditions might be like at the end of the day for your ride home. Keep in mind that getting caught in the rain on your way home is not nearly as disruptive as it is on your way to work. Once people get in the habit of cycling to work on a regular basis, many start to use their bikes in drizzle or light rain without giving it much thought. If it’s warm enough, you can simply go in your cycling jersey or non-water proof cycling jacket. Although the front of your clothes will get damp or a little wet, your backside will remain surprisingly dry in everything except solid rain. 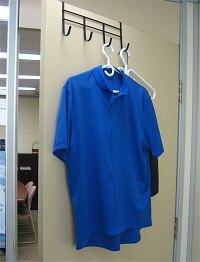 If you can find some place to hang them at work, clothing made of synthetic material will dry quite quickly. Ultimately, you may want to equip yourself with a waterproof jacket and pants. The only problem with this approach is that you’re going to sweat in anything that’s truly waterproof, especially in warmer weather. To help reduce the problem, look for rain gear with large vents and/or zippered openings under the arms, across the back, and along the legs. Expensive jackets and pants made of waterproof material that’s breathable will help a little, but when cycling, they still don’t allow water vapour to escape fast enough to prevent sweat build-up. When all is said and done, you’ll find that most cyclists adopt their own individual strategies for dealing with the rain which they are comfortable with. These tend to include some combination of tolerating a little drizzle or light rain, finding alternate transportation on those days when the weather is truly miserable, and getting some waterproof gear in order to ride through varying degrees of precipitation. After a while, you come up with a strategy that works for you. And finally, as mentioned earlier, bicycle fenders is a rain related item that you may want to consider. Inexpensive and lightweight plastic fenders are easy to install on most mountain bikes as well as hybrids and road bikes that have the necessary braze-ons (eyelets or mounting points). Fenders will keep the tires from spraying dirty road water onto you, your bike, and its components when riding in the rain. More importantly, they will keep you dry when cycling on wet pavement during one of those windows of opportunity when the rain has stopped. Okay, you have wondered about biking to work, given it some thought, and are now ready to take the plunge. You have identified a good cycling route, scouted out the best place to park and lock your bicycle, and picked a nice bright sunny morning for your first bike ride to work. What should your expect? You’ll probably find that your first ride is great, and that it is both invigorating and relaxing. If you’re riding one of the more popular paths or routes, you may end up cycling in the company of dozen other bicycle commuters. You’ll get a sense that you are accomplishing something before you even start your regular work day. If you already do a fair amount of recreational riding, you’ll discover that the physical demands for cycling to work are well within your means. If not, you may feel a few aches and pains, but you’ll gladly accept these as proof that you’re in the process of whipping your body into shape. on the Ottawa River pathway. While this upbeat view of bicycle commuting may persist for the first couple of rides, you’ll most likely enter a period when the novelty of the whole experience begins to wear off. At this point, there will be days when cycling to work may seem more of a burden than a pleasure. The simple fact is that riding to work everyday takes a little getting used to. Even if you’re relatively fit, this twice daily activity can be a little draining, and it may take a bit of time to build up your stamina. There may also be a need for some psychology adjustments. For years you may have equated commuting time with sitting back and minimum exertion. Needless to say, this will have to be updated to recognize that you’ll now be an active component in transporting yourself to and from work. How long it takes to get used to biking to work will vary from person to person. Two to three weeks for some people, a month or longer for others. Whatever the case, you eventually reach that point where cycling to work will seem as natural as commuting by car or bus. You’ll know when this happens the first time you resent not be able use your bike because you had to take the car or bus to work for some reason or another. From here on in, commuting by bike will become second nature to you, and it will seem no more out of the ordinary than getting in a car to battle traffic on the Queensway, or walking several blocks to the local bus stop. It will simply become part of your daily routine.